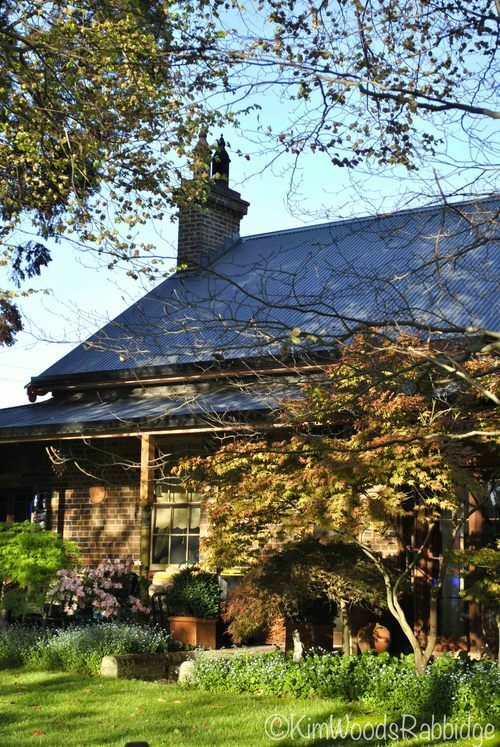 New England, in northern New South Wales, is one of those special temperate regions with very chilly winters, warm summers, an abundance of talented gardeners and absolutely superb gardens. 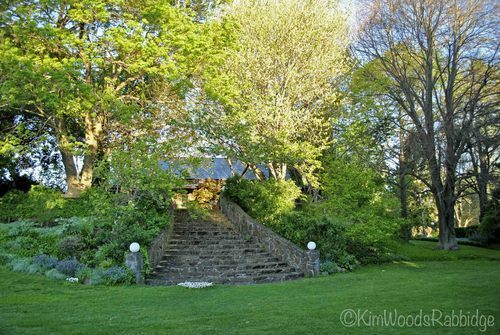 With weather familiar to early European pioneers, it’s no wonder they settled in so well and why Glen Innes has retained its Celtic character. 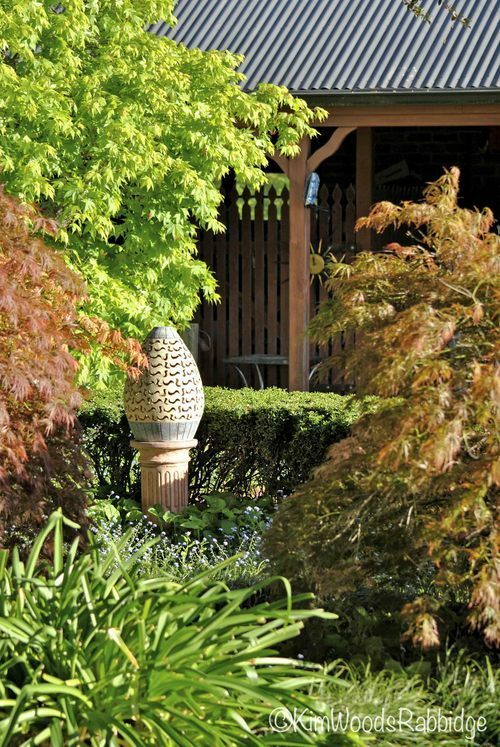 Peter and Coral Campbell moved to an historic home, Dursley, on the outskirts of town nearly four decades ago and began planting trees in a small fenced-in garden. All that was growing there was a ubiquitous cotoneaster, a photinia and an old pine ‘far too close to the house’, but there was also a protective laurel hedge, and a grand old Linden tree referred to by renown local nursery-woman, Mrs Biddle, as the best in the district. 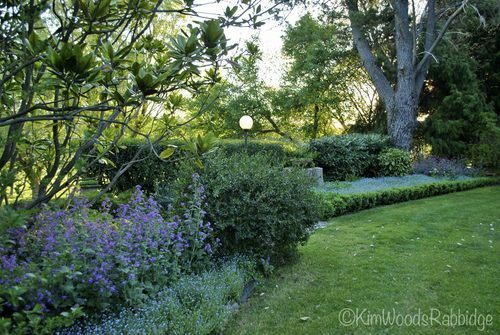 Today, beneath a canopy of magnificent trees in an extended, serene garden covering nearly two hectares, light sweeps over lush lawns, hedges are manicured and beds are filled with shrubs and perennials. 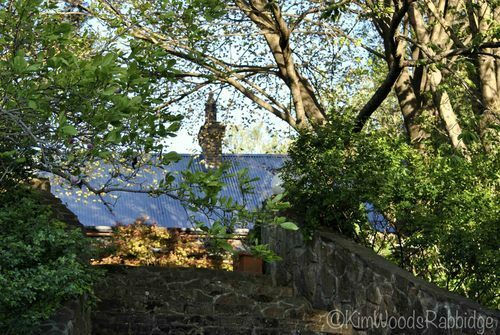 The original Linden tree on the right before coming into leaf. The construction of the magnificent stairs in the late 1990s became a family affair with sons Aaron and Brant assisting the stonemason. 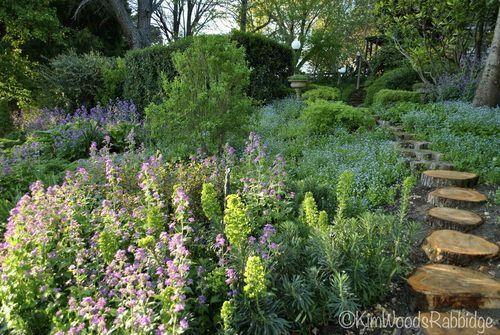 Banks flowing down to a peaceful sward of lawn were once covered in yellow broom and blackberries, but now host pretty perennials. 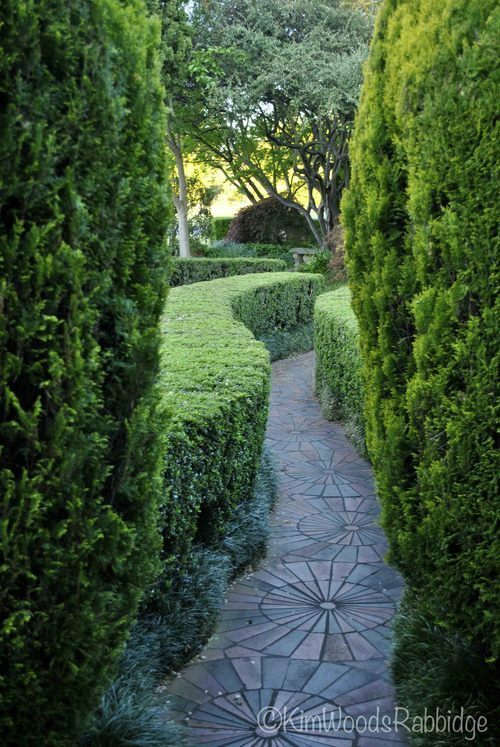 Bookleaf conifers have been trimmed early and often to achieve these compact exclamations at the end of the serpentine pathway. 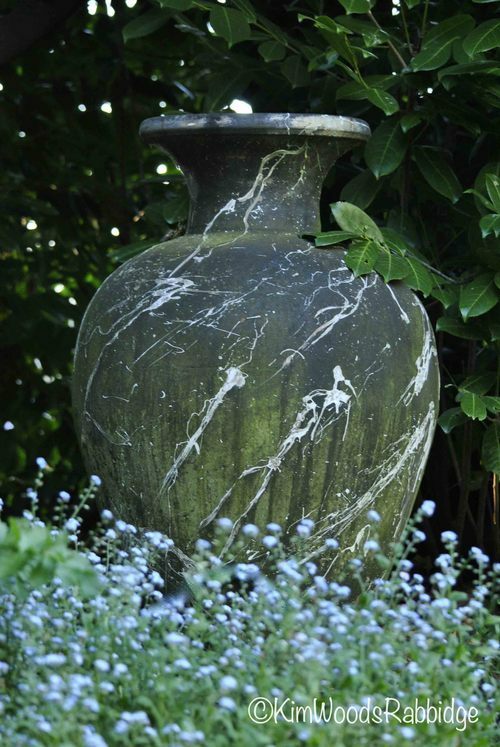 Topiared Japanese buxus, growing both in pots and the garden,make strong accents. Emerging Virginia creeper, above, is a serene and verdant cover over the walls in summer before exclaiming a fiery Hurrah! in autumn. 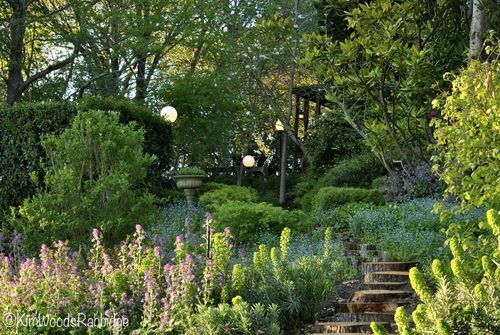 “It’s hard to plan an old garden unless you have a designer,” Coral reflects. 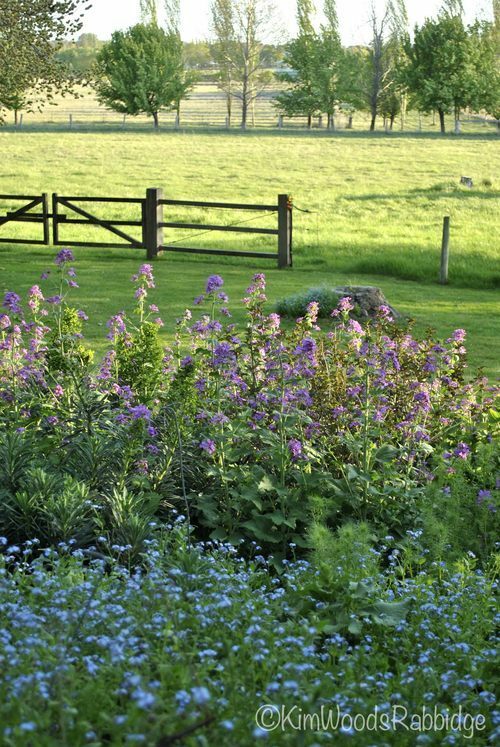 Like most gardeners she laments some of the early plantings which were too close to each other, or to the house. 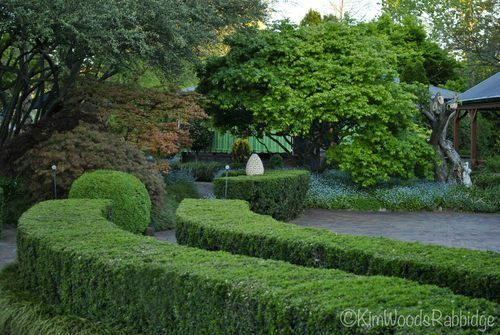 The creative paved path between hedges of Euonymus Tom Thumb and borders of Mondo grass. 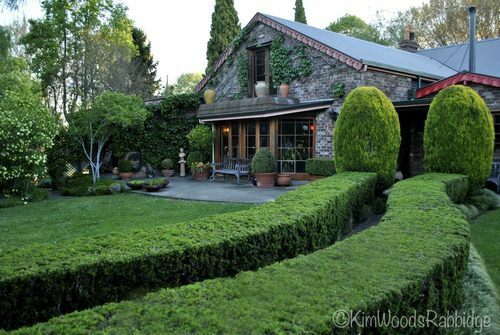 “As this Mondo grass is the taller growing variety we cut it right back every year or so. I should have planted the miniature one,” notes Coral. 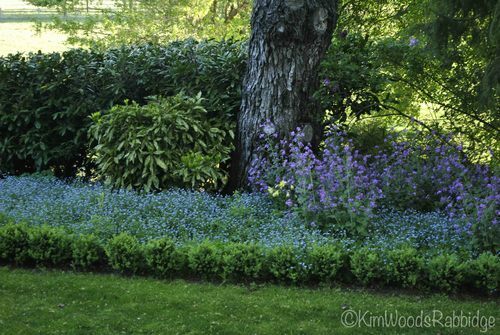 Waves of forget-me-knots are spellbinding throughout the garden each spring. They used to be cut back after flowering but now Coral prefers them pulled out. Still, a zillion seedlings pop up for next season’s encore. Maples are amongst Coral’s favourites. She especially loves their autumn display. 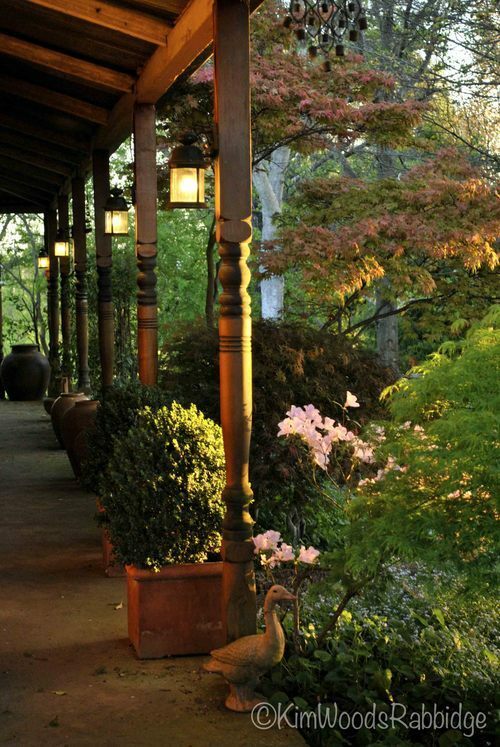 A simple coffee jar inserted into this Chinese lantern has served to protect this delightful powered garden light for many years. 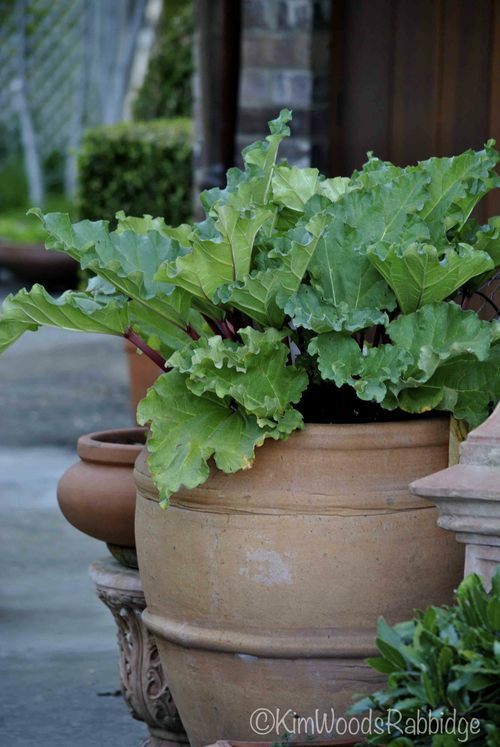 A few pots close to the kitchen door provide fresh herbs such as bay leaves, society garlic, parsley and even rhubarb. 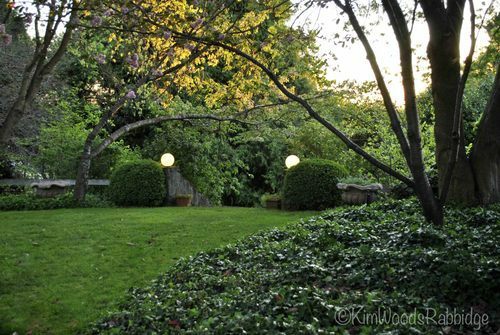 In the background a snowball tree (Viburnum) is in flower. 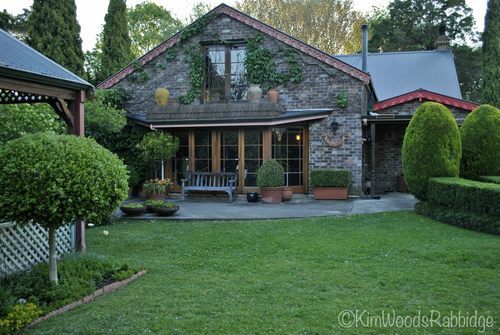 Daughter Tamara has her own very productive veggie patch in another part of the garden – we’ll visit it another time! When beginning their garden the Campbells used loads of cow and horse manure, and straw, to enrich the soil but now they use mainly mushroom compost, which is applied by the truckload several times a year. Water? 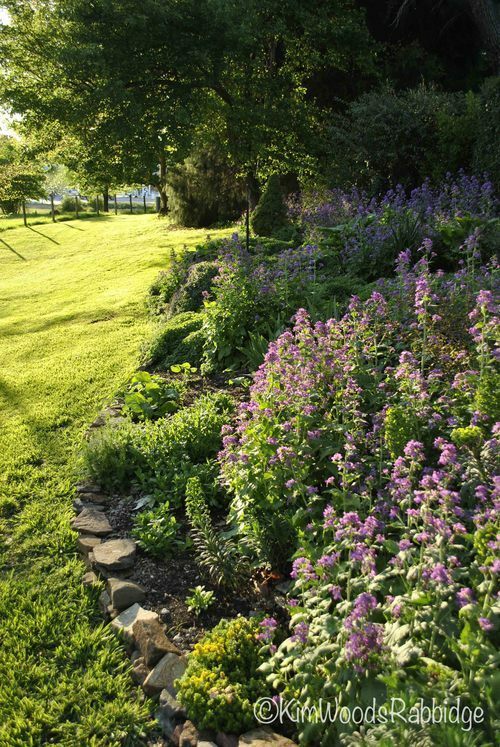 The garden benefits from a wonderful underground source, and a recently installed efficient watering system installed by Brant, replacing a less effective 20 year old one. One of dozens of beds at Dursley containing a variety of shrubs and perennials. Here a couple of claret standard maples contrast with the cream baubles of flowers on the snowball bush. 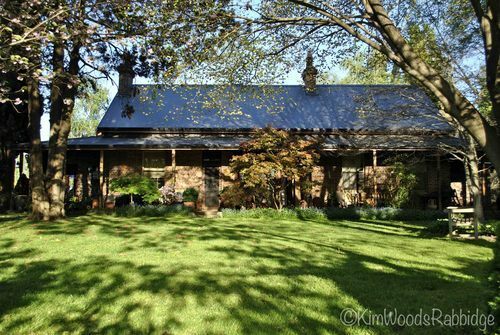 From the western side, the home could be mistaken for a cottage tucked into the garden. It’s difficult to get perspective because the trees are huge! 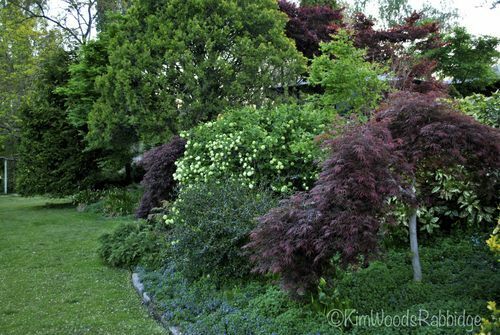 Branches of the golden elm on the right reach out to touch one of the flowering cherries. This peaceful western area is Coral’s favourite. 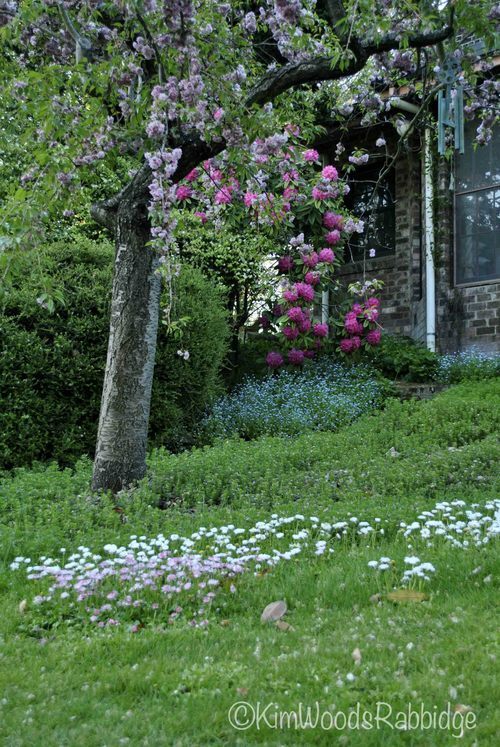 At the top of the stairs a variegated maple grows to the left and a Magnolia magnifica is on the other side. 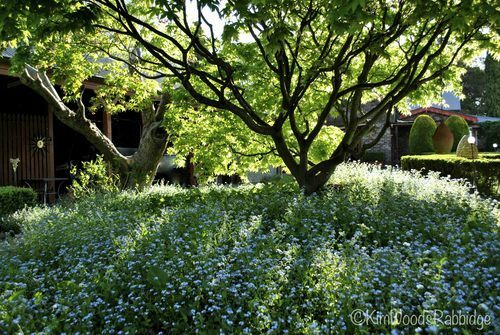 Large leaved ivy forms a carpet growing happily in the shade. At the base of the stairs a cheeky little patch of Bellis perennis has self seeded, and on the western border an old laurel hedge helps shelter the garden. Occasional features punctuate the landscape. For many years Coral ran a nursery from her garden – certainly a good excuse to acquire some special pots and ornaments if they didn’t sell! 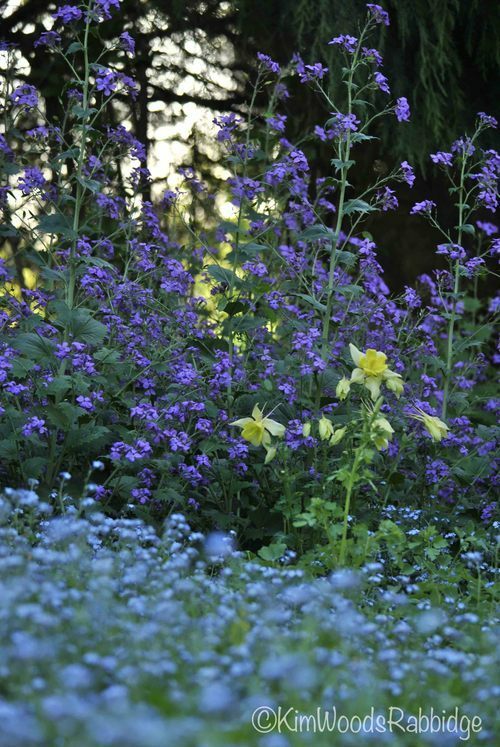 Aquilegias, honesty flowers and Gold Dust, Aucuba japonica make sweet companions amongst the Forget-me-knots behind a young English buxus hedge. Lombardy poplars and elms along the fence line in the paddock. The first trees Coral planted were in the bottom garden south and west. They included a golden elm, a tri-coloured beech, a tulip tree, silver birch, flowering cherries and a claret ash. A Tulip tree, accidently mown over by a (nameless!) young son, recovered and sprouted two trunks. 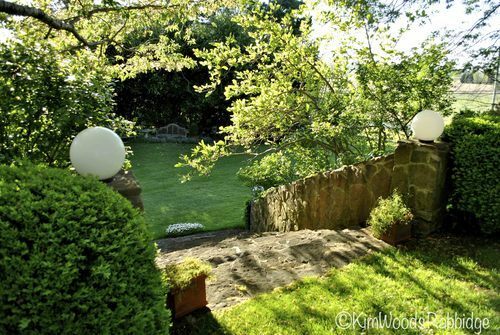 “I moved it when I realised how big they grow and now it’s a lovely tree in the bottom of the garden,” Coral says. Waste not! 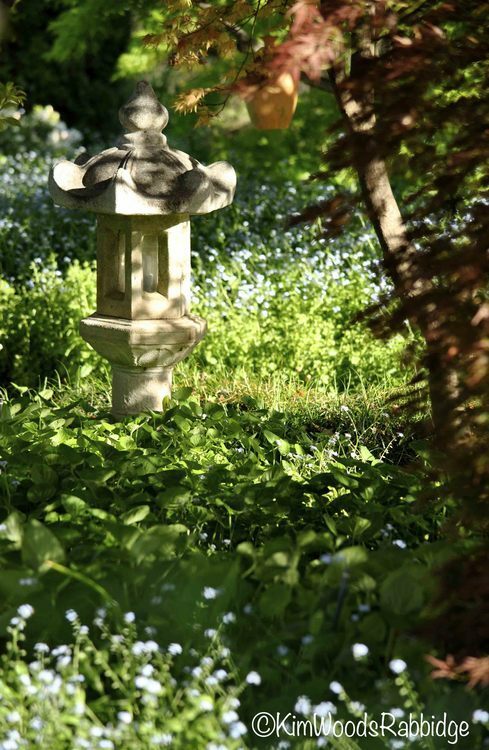 These stepping stones have been cut from one of the Chinese poplars Coral planted inside the original garden. They’ll most likely last around ten years before needing replacement. Like all good gardeners, Coral knows when the garden will benefit from a plant’s removal. Lime green euphorbia spires always make bright accents amongst other plantings. 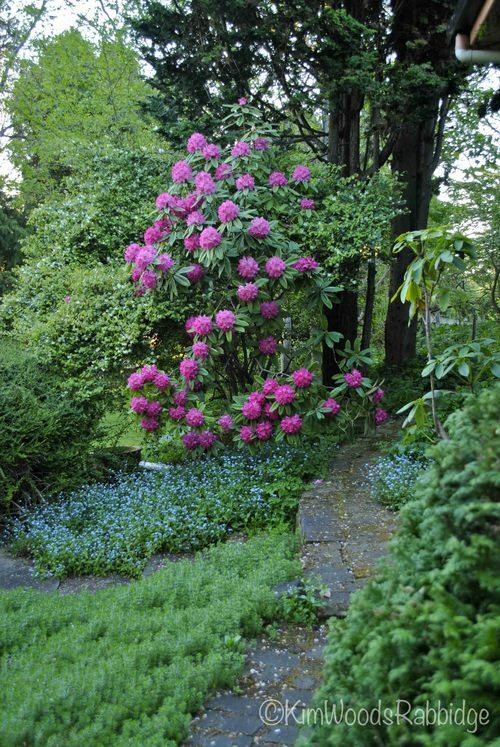 Colour harmonies: a weeping cherry and rhododendron. 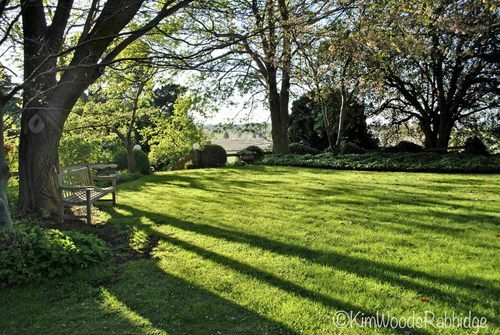 A row of significant English elms, growing along the roadside on the garden’s north when the Campbells bought the property, suffered years of abuse when powerline workers mercilessly hacked them. Sometimes protests and ‘discussions’ do pay off! The lines have been moved to the other side of the road and the trees should eventually recover. 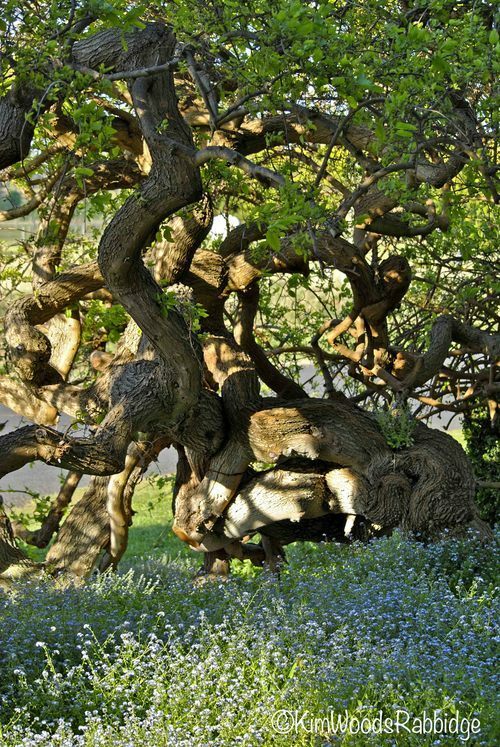 A soft haze of forget-me-knots contrasts with the wonderful gnarled limbs of an ornamental mulberry. Coral’s love of gardening has inspired the next generations: Brant’s planted dozens of trees on his neighboring block, including fifteen Dawn redwood trees which will be quite majestic in another decade or two. And Aaron’s young son Finn, immersed in beauty, has begun his gardening journey. 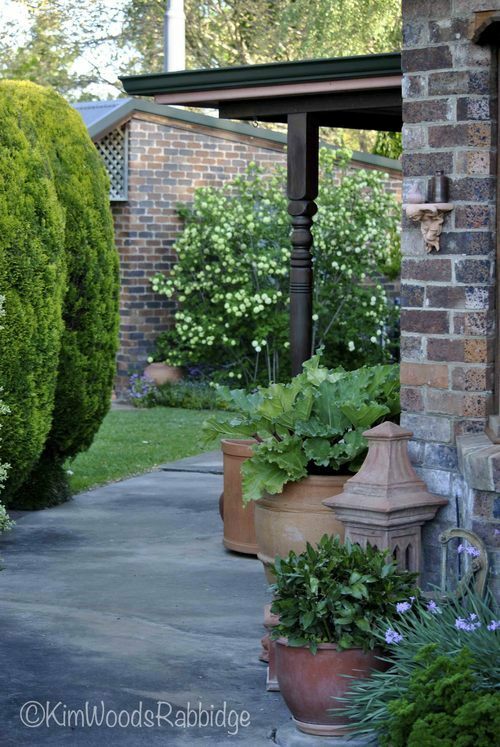 I have been loving the images on the Our Australian Gardens website. 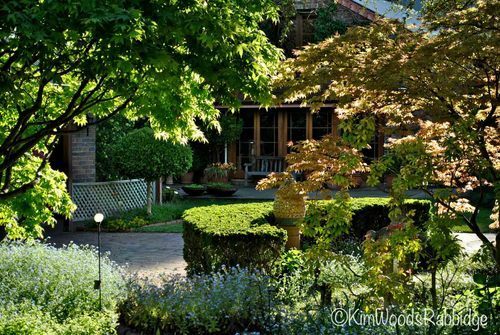 An initiative as significant as this is sure to further elevate garden design culture here in Australia. I just wanted to let you know I absolutely love my OAG emails and so enjoy looking at the glorious photographs. Not only are the photographs beautiful but the words used to describe them are beautiful and uplifting….such a joy to receive. I love Love LOVE! your latest blog on ‘Dursley’. Thank you so much for sharing your amazing blog with me. Your photographs are absolutely glorious, and great to see that you get a lot pleasure out of your projects. Just beautiful, thank you again. 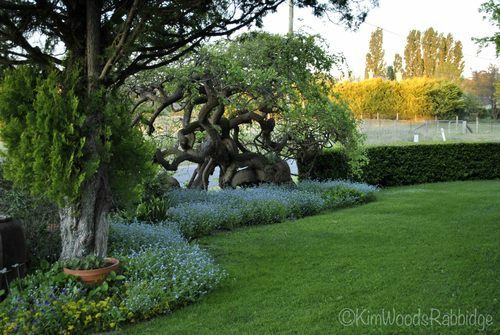 Fell in love with the ornamental mulberry, what a living sculpture it is. 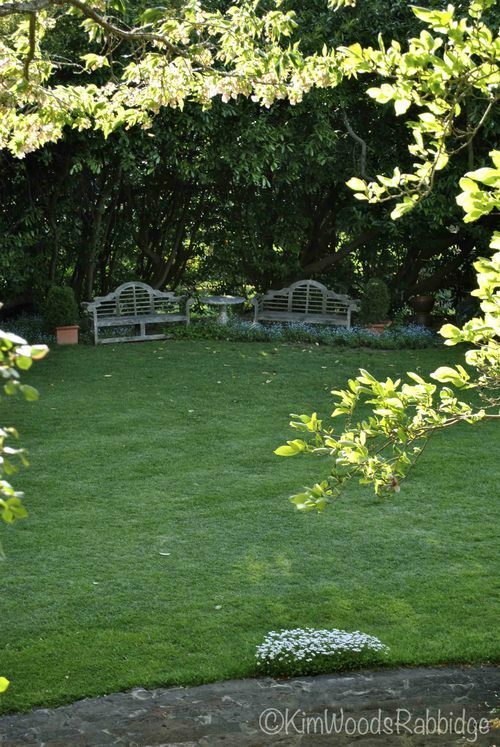 This beautiful garden is a never-ending gardeners delight. I grew up spending many of my holidays at Dursley with my Aunty Coral & Uncle Peter. Memories I will cherish for ever. 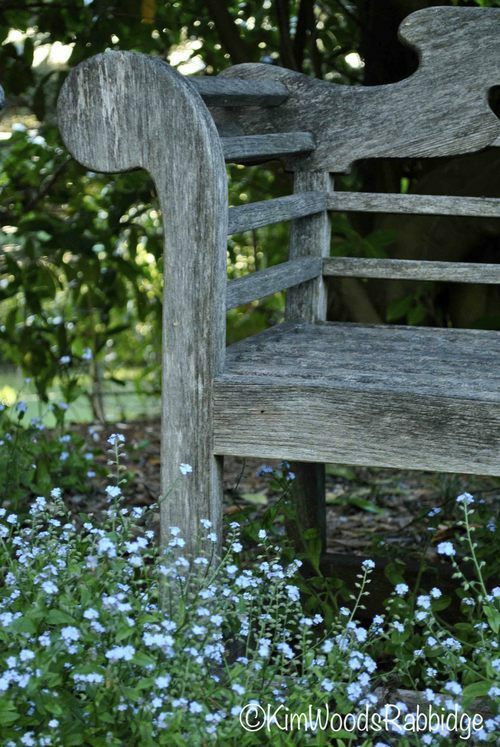 To be able to have watched the garden & home become what is today is inspiring. So very proud of what Coral & Peter have achieved. Simply beautiful.